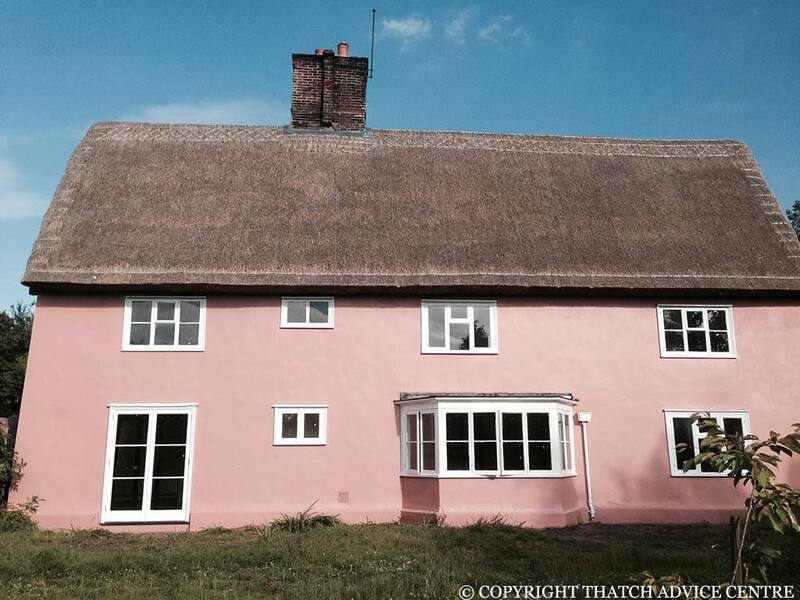 Longstraw is produced from straw specifically grown for thatching. The new varieties of straw for cereal production have straw which is too short for thatching. Long straw is grown (often the same variety as Combed Wheat Reed) but hollowed stemmed varieties are best for thatching eg Maris Widgen, Maris Huntsman. Roofs thatched in longstraw are more shaggy in appearance than those of Combed Wheat and Water Reed because they have both ears and butts showing on the main coatwork. The other materials have butts only showing. These roofs often have a spar pattern around the eaves and barges of the building and may also have flush ridges rather than block ones. Traditionally this material is initially produced in the same way as Combed Wheat Reed. The wheat is specially grown and then cut with a binder and tied into sheaves. The sheaves are then stooked in the field in small stacks to dry and then, in the old days, it was made into a rick which was a large stack which was thatched as a method of storage and to keeping the majority dry. The sheaves are then put through a threshing machine or drum to remove the grains. The Threshing machine pushed the straw out into a trusser where it was bundled. This material was not yet ready to use for thatching as Longstraw. (This is where the production of the material differs as combed wheat has a Comber on the top which combed the straws before it goes into a trusser and is tied into bundles. 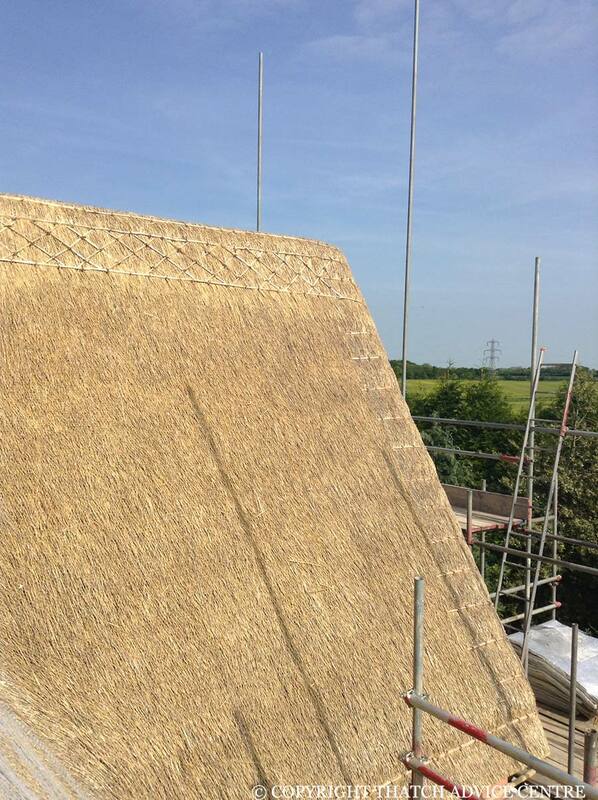 That is ready to use for thatching). The Threshed straw is first shaken out into a large bed with ears and butts mixed which is doused with water so that the straw becomes pliable. Water makes the straw more slippery and pliable so that individual handfuls of straw are easily ‘drawn’ from the bed. The amount of water used to wet the bed varies depending on weather conditions and the type of straw being ‘drawn’: If it is too dry, the straw will be hard to draw and more prone to breakage, whereas prolonged soaking reduces its durability. Knowledge and experience are important in this work. Double handfuls of straw are pulled from the bottom of the bed and formed into yealms approximately 130mm thick and 450mm in breadth (5” x 18“). Five or six yealms are tied into a large bundle. These bundles are then used for thatching in Longstraw. Longstraw production is therefore more labour intensive than Combed Wheat Straw and Water Reed and as such Longstraw work often commands a higher price. This coupled with its anticipated shortest lifespan means that it is not the first choice for new buildings. 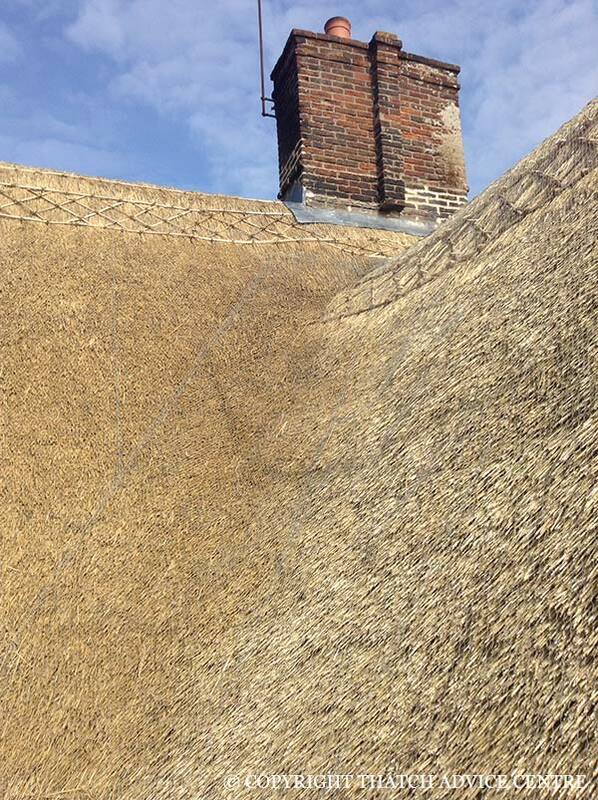 Listed Buildings with Longstraw roofs must rethatch with ‘like for like’ materials (unless listed building consent for a change of materials is made). Changing the material can change the look of a property considerably.